Take a slots break at Uptown Aces Casino and Uptown Pokies with a 300% match bonus added to your next Bitcoin deposit. 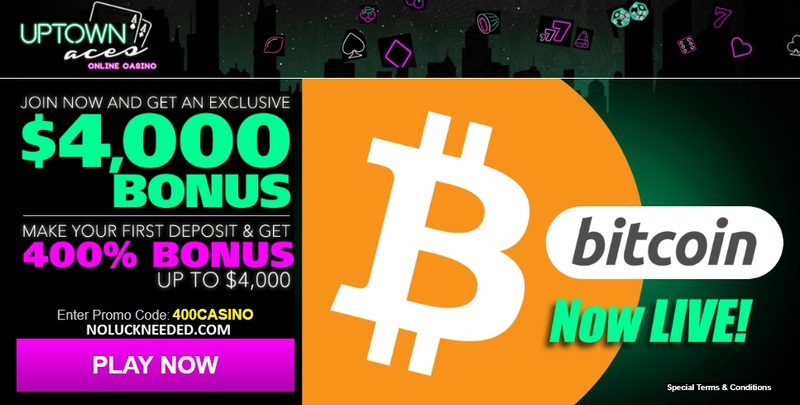 Redeem the coupon code BITCOIN300 in the casino cashier before making your next Bitcoin deposit of $30 or more on Wednesday, Thursday, or Friday. Your January deposit also allows you to redeem the $50 free chip loyalty bonus coupon code 2019TOKEN. Good Luck! Bitcoin deposits only. Valid Wednesday, Thursday, Friday. $30 minimum deposit. 40x wagering. No Maximum cashout! Bitcoin deposits only. Valid Once a week Friday, Saturday, Sunday. $35 minimum deposit. 35x wagering. No Maximum cashout! Spin and Win with Bitcoin, BitcoinCash and Litecoin at Uptown Aces Casino!